The Dir command displays and edits an object's normal direction. 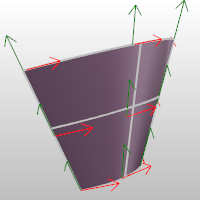 Closed polysurfaces, surfaces, and lightweight extrusion objects cannot have their normal direction facing toward the interior of the object. Arrows show the normal direction. Move the cursor over the object to show a dynamic arrow for the direction. Click the mouse to flip (reverse) the normal direction. Reverses the direction on all selected curves. The arrow color for the u and v directions matches the construction plane x and y axis colors. 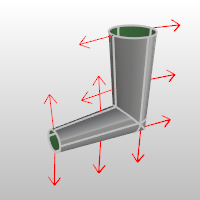 The draft angle for surfaces displays on the status bar. Reverses the surface u or v direction. Switches the u and v directions. Reverses the direction on all selected surfaces. Cycles through the Modes for all of the selected surfaces. Reverses the u direction or v direction for all of the selected surfaces. Reverses the normal direction for all of the selected surfaces. Switches the u and v directions for all of the selected surfaces. The colors of the surface direction arrows match the X/Y/Z axis lines set in Appearance: Colors Options. The normal direction arrow color is controlled by the Tracking lines setting in Appearance: Colors Options. The size of the arrows is controlled by the Direction arrow icon setting in Appearance Options. When a single curve is selected, the status bar displays the parameter value at the current marker location on the curve. The ShowDir command opens the Direction Analysis control and displays the direction of curves, surfaces, and polysurfaces. Direction arrows display on the object. Displays the object's normal direction. Reverses the surface u direction. Reverses the surface v direction. Set the display color for the direction arrows. The u and v direction colors are determined by the Options > Appearance > Colors settings for the X axis and Y axis lines. Add objects to the Direction Analysis display. Remove objects from the Direction Analysis display. The ShowDirOff command closes the Direction Analysis control and turns off direction display.